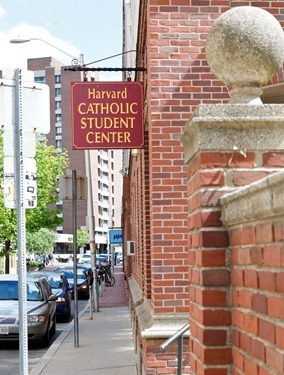 Thursday, there was a meeting of the Catholic chaplains of Ivy League universities hosted by Father Michael Drea at St. Paul’s Parish in Cambridge, the parish that serves Harvard University. They came together at Harvard because they serve similar demographics and face many of the same kinds of challenges. Among the speakers of the day were myself and Ambassador Mary Ann Glendon. This was a very important initiative, and so I was very happy to be able to be a part of it. 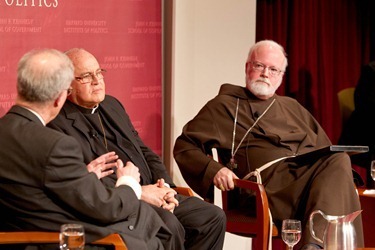 They are doing such wonderful work at The Catholic Center at Harvard. 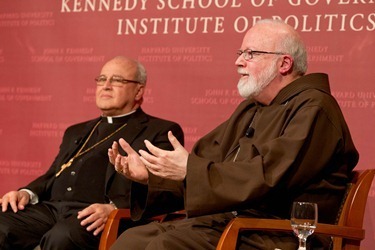 Of course, in Boston, where we have literally hundreds of thousands of students, this is a very important ministry and we are very grateful to all those who are engaged in it. And, on the topic of campus ministry, also this week we had the confirmations of young men and women from the various university campuses who came to be confirmed at the Cathedral. Once again, it was the work of the ministers at those universities that prepared these candidates. 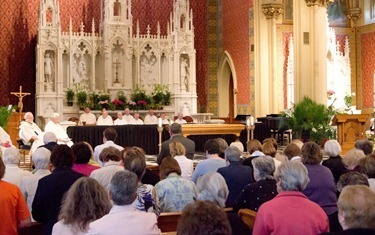 There were over 50 candidates confirmed at the Cathedral. 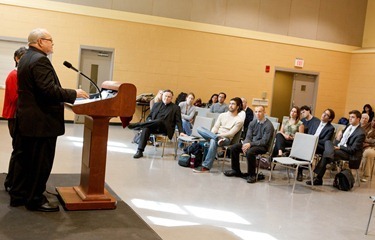 Friday, we held an all-day conference, the “Co-Workers in the Vineyard of the Lord Conference” at Our Lady Help of Christians in Newton. 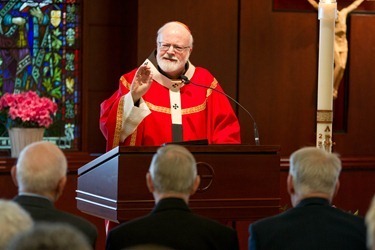 It is organized for lay ministers by our Theological Institute for the New Evangelization of St. John’s Seminary. The theme of this year’s gathering was “Excellence in Pastoral Leadership”. 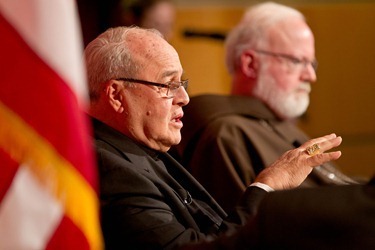 The day featured a keynote by Father Michael Keating of the University of St. Thomas, talks on the issues of pastoral planning and physician assisted suicide and a panel discussion. 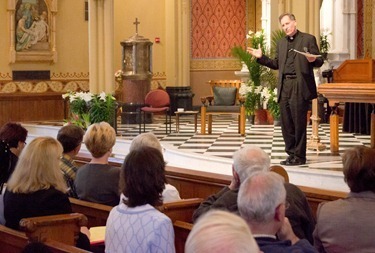 This conference has been an excellent opportunity for the ongoing education of our lay ministers in the parishes. We are very grateful to Aldona Lingertat and all those were involved in organizing the day. That evening, I celebrated Vespers and holy hour with the seminarians, and then … we went to the movies! Alexis Walkenstein at the Maximus Group had arranged a private showing of the movie “For Greater Glory,” which is coming out in June. The movie stars Andy Garcia and Peter O’Toole and tells the story of the Cristiada, the rebellion that arose against persecution of the Church in Mexico during the 1920s and 30s. This was a very tragic time in the history of the Church in Mexico. Thousands were killed during the persecutions and many places were left completely without priests. Graham Greene, after his conversion to Catholicism, went to Mexico as a journalist and also, while he was there, wrote report for the Vatican on the persecution. When he returned, he wrote the book “The Power and the Glory” which, to me, is one of the greatest Catholic novels. It is the story of the last priest in the State of Tabasco, Mexico, because all the other priests have been driven away by the government. They were told they could only stay if they married and pledged allegiance to the government. So, he was the only priest who was left and, in the end, he is executed by firing squad. Many Americans do not know very much about the persecution, but a lot of Catholics are acquainted with that book, the power and the glory by Graham Greene and also with the life of the Jesuit Miguel Kroll whose martyrdom is often spoken about the states. Though there were many people who suffered for the faith during this period of Mexican history. Blessed Pope John Paul II beatified about 25 people who were martyred in this period and I believe two have already become saints. The Knights of Columbus are one of the groups that is promoting this movie and I wholeheartedly recommend it. 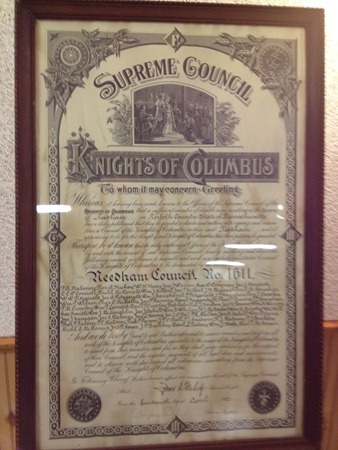 On Saturday, I attended the Centennial celebration of the Father Daniel Kennedy Council Knights of Columbus in Needham. They renamed the Council for Father Dan Kennedy who, many of you may remember, tragically passed away in 2008, shortly after his ordination. 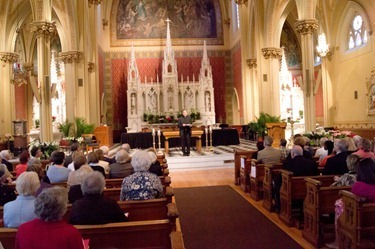 His family was there, as well as a number of priests with past or present connections to the Council including Bishop Hennessey, Father David Michael, Father Guy Sciacca, Father Phil McGaugh, Father Patrick Armano and Father Paul Sullivan and friends of Father Kennedy — Father Matt Westcott and Father Joe Mazzone. At the ceremony, I thanked them for renaming the Council in honor of Father Kennedy. I also thanked Father Dan’s family and his parents, Dan and Allison. 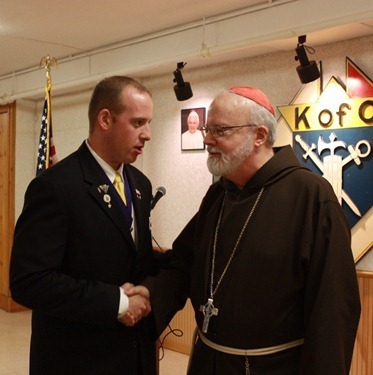 Father Kennedy was a wonderful young priest whose time with us was very short before God called him home, but he did so much good and was a great promoter of vocations. 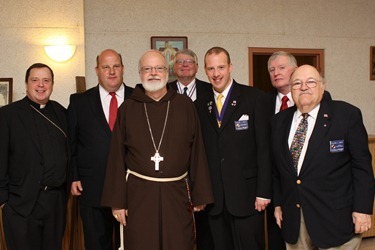 This council, in particular, has been very supportive of our seminarians I wanted to thank them for all of that work. 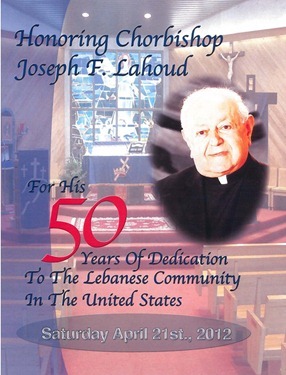 From there we went to the Lombardo’s in Randolph for a celebration of honoring Chorbishop Joseph Lahoud for 50 years of service to the Lebanese community in the United States. 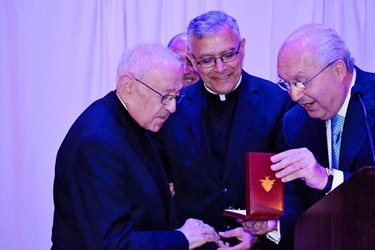 For many years, he was the pastor of Our Lady of Cedars, the oldest Maronite community in America. 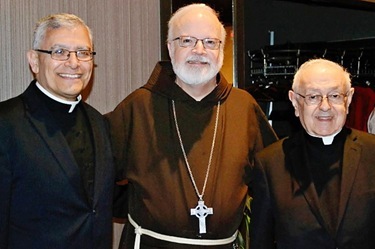 He is retired now, but he served the community here for 50 years and we are very grateful for the work he has done helping to build and strengthen the Maronite community in Boston. He was decorated with the National Order of the Cedar, one of the Lebanese government’s highest honors. The Lebanese ambassador came from Washington to bestow it upon Msgr. Lahoud in the name of the president of Lebanon. I publicly thanked the president of Lebanon for honoring Msgr. Lahoud and praising his witness. 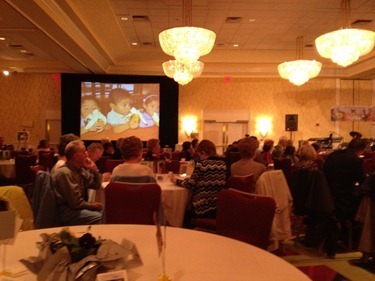 Sunday afternoon was the Irish Hearts for Haiti third annual benefit. As the name implies, this effort is, in great part, the work of local Irish people, though of course all are welcome. Winnie Henry (the widow of a very famous Irish singer, Noel Henry) and Gerry McGrath were the co-chairs. This organization has been supporting orphanages and other charitable works in Haiti. We were even able to meet some of the children they help at the dinner. It may seem something of an odd combination —Irish and Haitians. But, as I told the people during my remarks at the dinner, as Irish people we are so conscious of our own history and the famine that claimed the lives of so many millions of Irish. So, it is only natural that the Irish people should identify with other people in times of great need and natural disaster. This organization is certainly an example of that and I thanked them for all of their hard work and generosity on behalf of the Haitian people. And of course, as with any Irish gathering, there was a lot of music and entertainment. 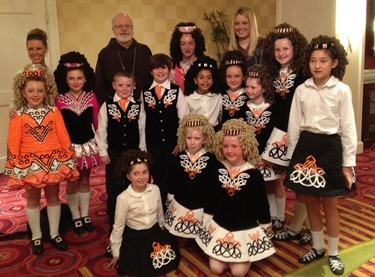 I was happy to take a picture with these young step dancers who gave a wonderful performance. 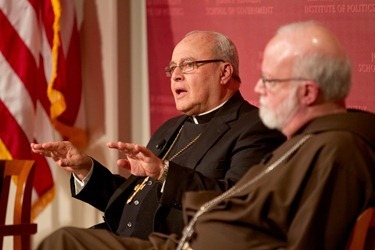 That evening, I was very happy to welcome Cardinal Jaime Ortega of Havana to the archdiocese. He was here for a few days and made a number of local appearances. Sunday evening, there was a fundraising dinner for Friends of Caritas Cubana organized by Dr. Ralph de la Torre, the CEO of Steward Health. 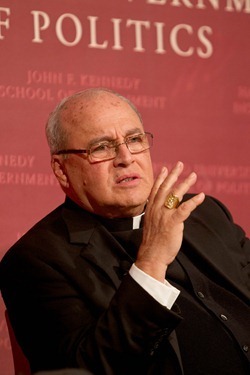 Originally, the idea had been to have the dinner at Fenway Park because Cardinal Ortega, like most Cubans, is a baseball fanatic. Unfortunately, the weather did not cooperate, so it had to be moved to another location. But, despite the change in venue, it was still a very enjoyable evening and I was so pleased that we were able to help support the charitable works of the Church in Cuba. Thanks in great part to the efforts of Consuelo Isaacson and Micho Spring, Friends of Caritas Cubana actually provides 20% the budget of Caritas Cubana every year. 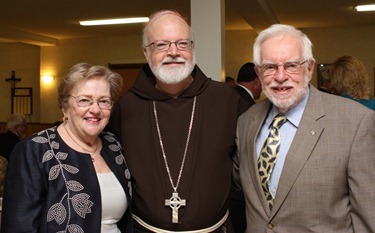 These funds enable important works of mercy — taking care of small children, the elderly, feeding families – just wonderful work that is being done. 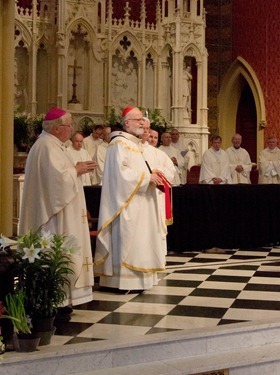 Then, Cardinal Ortega made two appearances here in the Boston area. 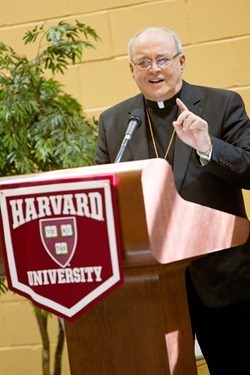 Monday he was at Boston College where he celebrated Mass and met with the Spanish-speaking priests and Hispanic students. 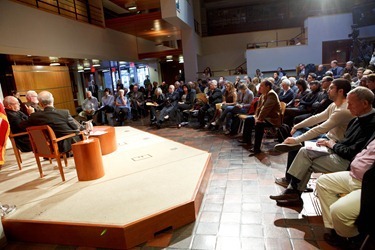 He gave a conference and afterwards had dinner with many of the Spanish-speaking faculty. 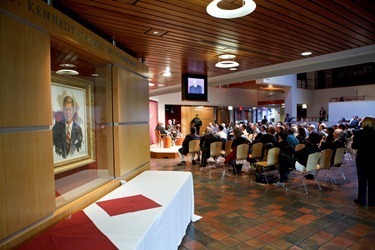 The following day, he went to Harvard where he met with students at the Harvard University Catholic Center in the afternoon. 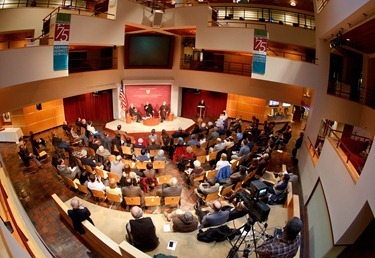 Then, in the evening, he participated in a panel discussion at the Forum of the Harvard Kennedy School of Government. 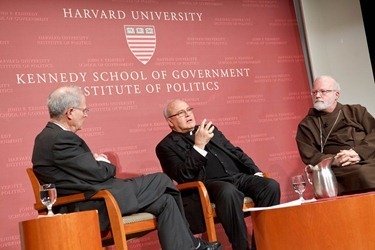 The panel consisted of Cardinal Ortega, myself and Jorge Dominguez, the Vice Provost for International Affairs at Harvard. It was quite an interesting discussion. It went about an hour-and-a-half and was standing room only. 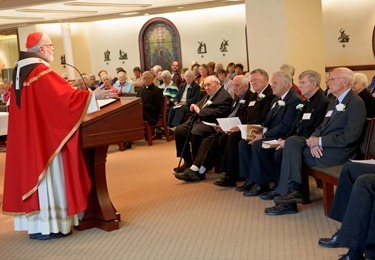 Each year, we have a gathering for religious brothers who are celebrating their Jubilees. 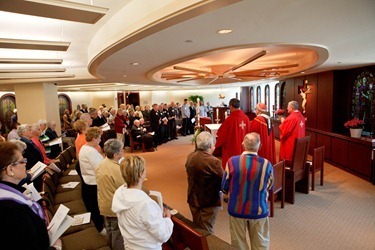 In the past, we celebrated it at the Cathedral, but in recent years we have been holding the Mass here at the pastoral center. 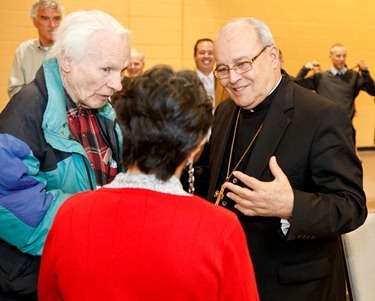 So, I was pleased to invite the jubilarian brothers to the Pastoral Center on Wednesday. 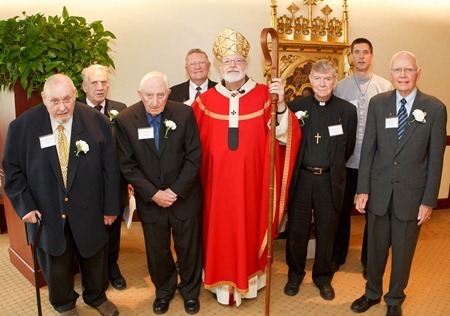 Brother Donald Birtles, CFX, was celebrating his 70th anniversary. 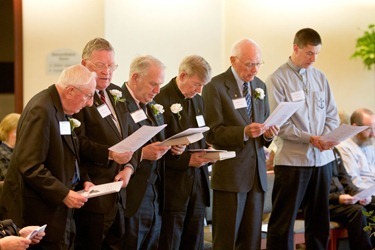 Brothers Frederick Codair, CFX; John Doyle, CFX; John Kerr, CFX and Brother James Lucas, OMI were all celebrating their 60th anniversary. 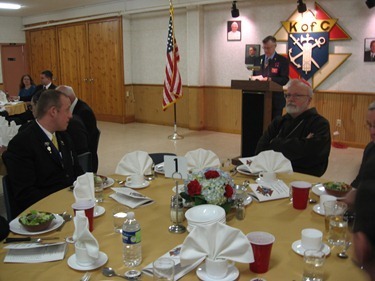 Brother James Eckert, CFX was celebrating his 50th anniversary and Brother Rahl Bunsa of the Brotherhood of Hope was celebrating his 25th anniversary. 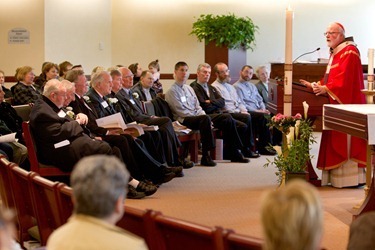 The vocation of brothers is not as well known in the Church as that of religious women, but they have had a great impact, particularly in the field of Catholic education, but also many other ministries. 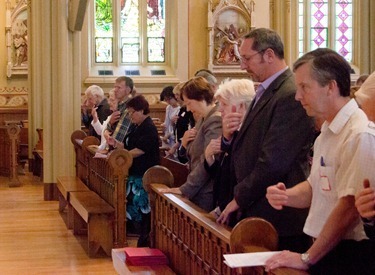 At the Mass, the Gospel reading was about preaching the Gospel accompanied by signs. As I said in my homily, these brothers are signs of Christ’s presence among us in their consecration, fidelity to the Church and service to God’s people. Congratulations to our Jubilarian brothers!